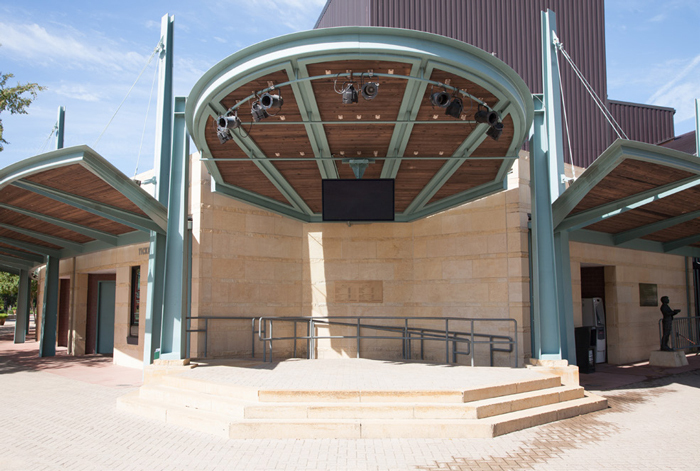 Near the close of the 2013 Season, Miller Outdoor Theatre, a free-to- the-public outdoor theatre located in Houston, Texas, decided it was time to update its communication processes and provide its patrons with an enhanced entertainment experience. Located in Houston’s Hermann Park, a city known for unannounced tropical weather, Miller’s patrons would often rely on last minute decisions regarding staying at a show during inclement weather or leaving before the show ended. Oftentimes, Miller alerted visitors of show delays or inclement weather via social media and phone calls made to the Theatre’s general phone line. To spread news about upcoming events, shows, and park rules, Miller relied on live communication with the audience during shows. With the Theatre located in an area of the park that receives heavy foot traffic, Theatre staffers would often be asked to provide directions to nearby attractions. To better serve these patrons, Miller wanted to offer a solution with wayfinding capabilities. In addition to the need to provide its patrons with a more enhanced experience, better handle crowd management, and share relevant rules and regulations as well as directory information for Hermann Park, Miller was looking to broaden its advertising opportunities. The Theatre wanted to work with neighboring organizations located inside the park, including The Houston Zoo, the Museum of Natural Science, the Houston Garden Center, and the Japanese Garden, to further build attention for the park. However, Miller had no way of spreading this information. To meet these goals, Miller knew it needed to turn to a digital signage solution. Due to its multifaceted communication needs and outdoor environment, Miller decided it needed a solution that could update and inform visitors in a simple and timely manner, while being able to withstand the unpredictable weather. To find such a solution, Miller turned to Peerless-AV®, a company known for creating the industry’s first fully sealed outdoor displays. To meet Miller’s needs, Peerless-AV® recommended its Xtreme™ 55″ Daylight Readable Displays. Featuring a Patented Ventless Dynamic Thermal Transfer™ system, the internal elements of the Peerless-AV® Xtreme™ Daylight Readable Displays are kept safely warmed in extreme cold and properly cooled during extreme heat without exhaust ventilation – something crucial for Houston’s unpredictable weather. As an outdoor theatre with 1,705 covered seats and the remainder of seating uncovered on the lawn, Miller needed displays that not only could handle inclement weather, but ones that would be viewable in all lighting conditions. The Peerless-AV® Xtreme™ Daylight Readable Displays can be seen in direct sunlight thanks to optic bonding that reduces the glare through the UV absorptive gel, ultimately eliminating reflection. Optic bonding also reduces the display’s solar load, keeping it cooler and preventing screens from blacking out from overheating. With budget a key concern for Miller, the Peerless-AV® Xtreme™ Daylight Readable Displays proved to be a strong solution, offering a reduction in operational costs over the long-term. Thanks to the optic bonding of the displays, the need for fans and filters or air-conditioned, protective enclosures is negated. As such, Miller will see a decrease in energy consumption and maintenance costs over time. With the new displays in the process of being installed, Miller has big plans for its upcoming digital signage needs. The displays will be used for all 135 yearly events, with additional use during some children’s performances that take place later in the mornings. To provide a fully enhanced experience to patrons, the displays will be placed at both entrances to the seated theater, with two displays at the concession stand, and one display above the small stage, totaling five digital signage displays throughout. Miller plans to utilize the new displays for weather updates, information on upcoming shows and tickets, menus, rules and regulations of the theatre, wayfinding, advertisements, and even a live view of the stage during shows. Visitors will be able to enjoy a more electric vibe throughout the theatre and Miller will improve communication with visitors thorough information shared onscreen. Peerless-AV, a Peerless Industries, Inc. company, is a leading designer, manufacturer and distributor of Made-in-the-USA audiovisual mounting, accessory and digital content delivery solutions as well as the industry’s first fully sealed outdoor TVs for commercial and residential applications. The company’s innovative AV products span off-the-shelf, commercial and custom flat panel, projector and tablet mounts as well as cables, AV carts and stands, medical carts and stands, AV racks, AV furniture and a wide range of other accessories. The Peerless Technology Division specializes in wireless, kiosk, touch, digital audio and connectivity technologies that simplify today’s complex digital equipment installations. Peerless-AV manufactures over 3,600 products that serve original equipment manufacturers, commercial integrators and consumer retailers in 22 vertical markets through direct sales representatives and authorized distribution. For more information, visit www.peerless-av.com.